Estimated 2-6 Business Days with UPS Ground. Lithium Batteries are only charged to 30% of capacity. When you receive this battery it may need to be charged. This is the battery charger we recommend for this battery: OptiMATE Lithium TM-471. Replaces: YTX12-BS, YTX14H-BS, YTX14, YTX14L, YTX14H, YTX14-BS, YTX14L-BS, YTX16-BS, YTX16-BS-1, HYB16A-AB, GYZ16H, and the GYZ16HL. 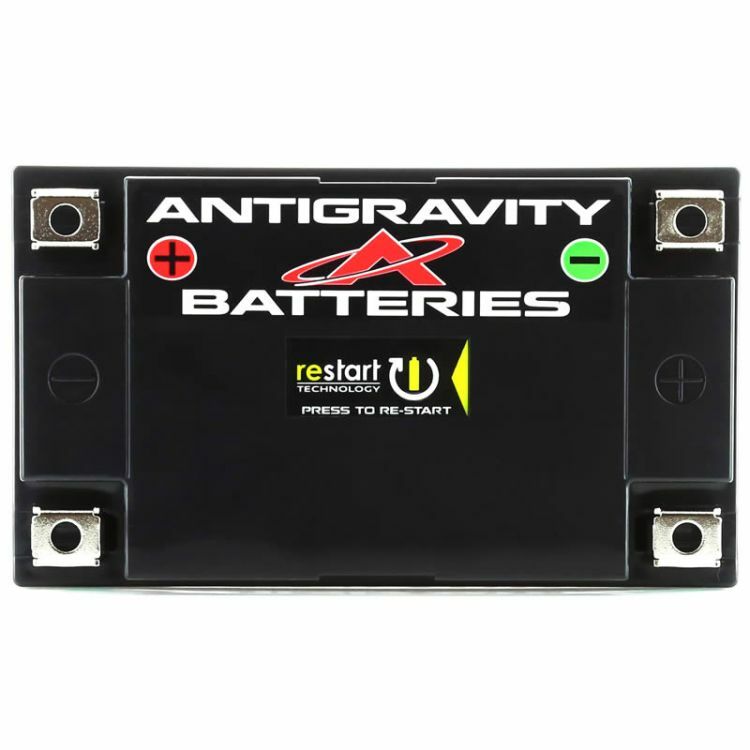 The NEW Antigravity ATX12-HD-RS battery is built with Antigravity's groundbreaking RESTART Technology (built-in jump-starting) so you won’t ever get stranded with a dead battery again! The ATX12-HD-RS is a hi-power, lightweight Lithium-Ion battery that directly replaces the OEM Lead/Acid YTX12-BS, YTX14H-BS, YTX14, YTX14L, YTX14H, YTX14-BS, YTX14L-BS, YTX16-BS, YTX16-BS-1, HYB16A-AB, GYZ16H, and the GYZ16HL. The revolutionary ATX12-HD-RS RE-START Battery intelligently monitors its status, and just before going completely dead puts itself to sleep with just enough energy to get your vehicle started again. Simply press the RE-START button located on the battery, start your vehicle and drive away… No more dead battery emergencies or being stranded! 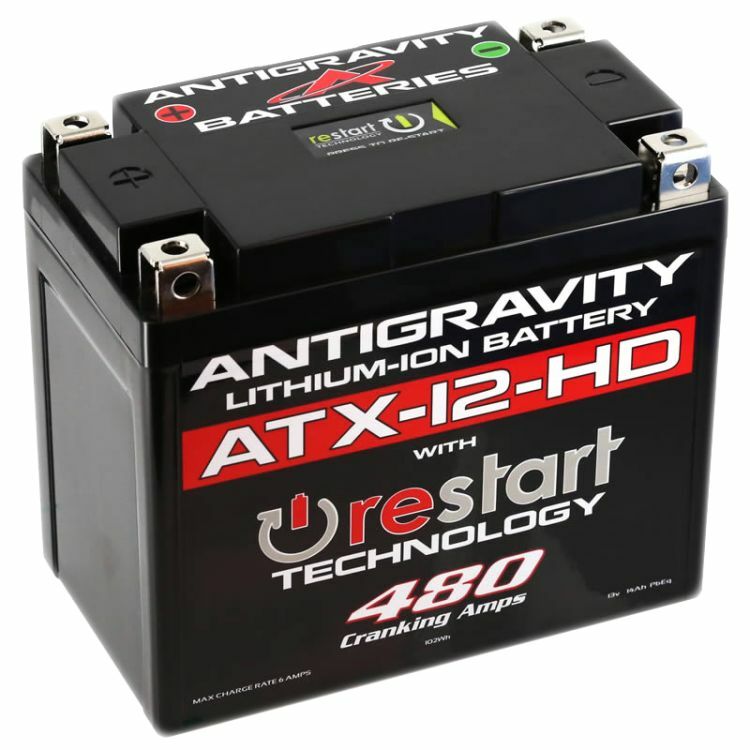 The new ATX12-HD-RS is an extremely lightweight and high-power Lithium-Ion replacement battery for the heavy lead/acid YTX12 battery found in many Motorcycles and Powersport Vehicles. The ATX12-HD-RS offers the first FULL Battery Management System (BMS) found on a Powersport Battery and includes low-voltage cut-off, over discharge, over-charge, and thermal protections with real time lithium-ion cell balancing. Excellent for every day use in bikes up to 1500cc. Excellent for use in Race Cars of all types up to 500 Horsepower. Not for use with Personal Water Craft (PWC). Not for deep cycle application. Meant for starting applications only. RE-START TECHNOLOGY: The RE-START Battery intelligently monitor its status; if it senses over-discharge it will put itself into a sleep mode, yet saves enough energy to allow you to RE-START your vehicle. FULL Battery Management System (BMS) including Over-Discharge, Over-Charge*, Thermal Protections and Cell Balancing. Up to twice the lifecycle of lead/acid, and other Lithium batteries due to full Battery Management system. LOW SELF-DISCHARGE: The RE-START Batteries do not self-discharge like Lead/Acid Batteries. They can hold a charge up to a year provided there are no “Parasitic Drains”. Bikes with accessories that draw power when bike is off like alarms, ECUs, GPS, heated grips, and other accessories should be maintained with a charger. Per Antigravity Inc.:*Over-Charge protection will not protect from a faulty/old Voltage Regulator spiking Hi-Voltages to Battery. If you have a Pre-1990s Motorcycle replace your voltage regulator; it is over 25 year old and most likely broken by now. Do you own the AG-ATX12-HD-RS? Please, tell us what you think about it. It helps us provide you with better products. Please note that it may take up to 72 hours for your review to appear.